The New Moon at 22+ degrees of Gemini was in conjunction with a trans-Neptunian body 19521 Chaos, which was discovered almost 20 years ago. 19521 Chaos has an orbital period of 309 years and its orbit never crosses the orbit of Neptune. In contemporary language when we speak of chaos, we are usually referring to a state of confusion. However, 19521 Chaos is named after the primeval state of existence in Greek mythology, the dark, formless void preceding the creation of the universe. The first gods appeared from that void, including Gaia (Earth). Chaos was a creator like no other. It is almost as if the ancient Greek had been aware of the Big Bang. The Big Bang did not come out of nothing. There was a chaotic state, where time and space as we now understand them were yet to form. Our current understanding of time and space cannot be applied to the time which preceded the Big Bang. It was a moment of great transformation. 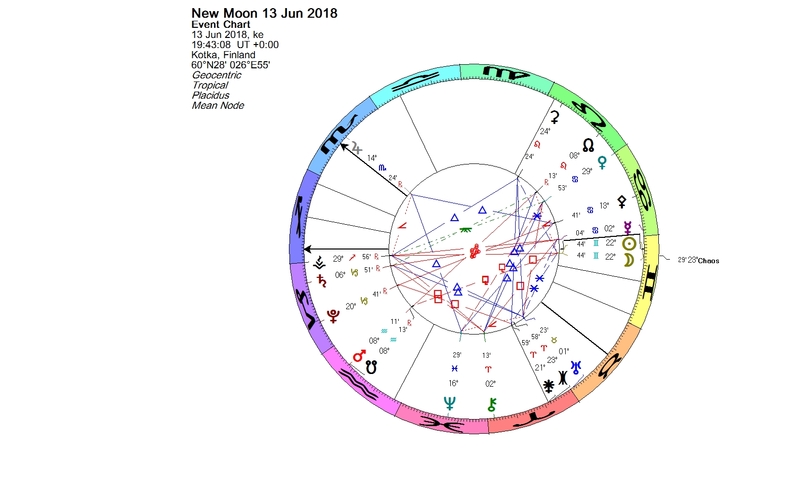 Stephen Hawking, who meritoriously studied the origin of the universe, has an exact sextile aspect between his Sun and Chaos in his natal chart. Dualism and polarity are important principles of astrology; there are two poles in everything. The phrase “edge of chaos” has come to refer to a metaphor that some physical, biological, economic and social systems operate in a region between order and either complete randomness or chaos, where the complexity is maximal. It is this area slightly off the familiar ground, where new energy takes form and fresh solutions emerge. Feb. 9, 1916 — Tristan Tzara “founds” the art movement Dadaism, an art movement of the European avant-garde. The Dada movement consisted of artists who rejected the logic, reason, and aestheticism of modern capitalist society, instead expressing nonsense, irrationality, and anti-capitalist protest in their works. Feb. 14, 1922 — Finnish Minister of the Interior Heikki Ritavuori is assassinated. The murder of a government minister is a rare occurrence in Finland. Feb. 20, 1925 — Robert Altman, American film director was born. Feb. 21, 1925 — Sam Peckinpah, American film director was born. Feb. 26, 1932 — Johnny Cash, American country singer was born. Feb. 27, 1932 — The Mäntsälä rebellion, a failed coup attempt by the Lapua Movement to overthrow the Finnish government, occurs in Finland. March 7, 1940 — Rudi Dutschke, German radical student leader was born. March 9, 1942 — John Davies Cale, a Welsh musician, composer, singer, songwriter and record producer who was a founding member of the American rock band the Velvet Underground, was born. Apr. 11, 1970 — Apollo 13 is launched toward the Moon but the lunar landing was aborted after an oxygen tank exploded two days later. Despite great hardship the crew returned safely to Earth. May 10. 1994 — Nelson Mandela is inaugurated as South Africa’s first black president. June 6, 2013 –Edward Snowden discloses operations engaged in by a U.S. government mass surveillance program to news publications and flees the country, later being granted temporary asylum in Russia. This entry was posted on Wednesday, June 13th, 2018 at 11:25 pm	and is filed under New Moon. You can follow any responses to this entry through the RSS 2.0 feed. You can leave a response, or trackback from your own site.